The Fourth of July is an iconic American celebration characterized by parades, fireworks, and backyard barbeques. But where did the history of the Fourth of July holiday begin and how did celebrations change over time? In Philadelphia, Pennsylvania on July 4, 1776 as Second Continental Congress adopted the Declaration of Independence. On this day in 1776, the Founding Fathers formally declared independence for the thirteen colonies. Since then, this monumental document has been at the center of an annual celebration of American democratic values. Armed conflict between the North American colonies and Great Britain began in 1775 after British troops and colonial militiamen entered a battle at Lexington and Concord. The Second Continental Congress, a body of delegates from each colony, did not meet until a year later in1776 in Philadelphia to discuss formal independence. On June 7, 1776, Richard Henry Lee, a delegate from Virginia, presented a resolution declaring independence from Great Britain. 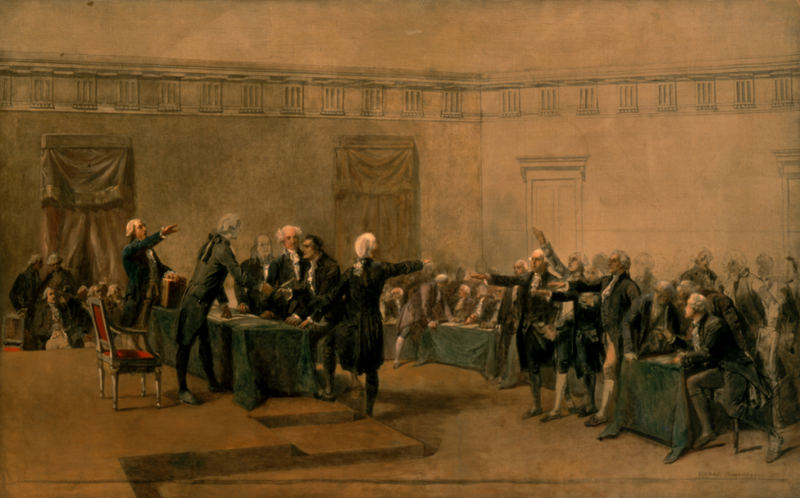 On June 11, 1776, the Congress selected Thomas Jefferson, John Adams, Benjamin Franklin, Roger Sherman, and Robert R. Livingston to serve on a committee responsible for drafting a declaration of independence. Committee member Thomas Jefferson drafted the official document. By June 28, 1776, the committee prepared the Declaration of Independence and read the resolution to the Congress. Below, actor Danny Glover recites Frederick Douglass’ Fourth of July oration on the invitation of historian Howard Zinn. Poster advertising the Fourth of July event hosted by the Massachusetts Anti-Slavery Society on July 4, 1854. Credit: Massachusetts Historical Society. Two years later, the Massachusetts Anti-Slavery Society took a similar approach to celebrating the Fourth of July by holding an anti-slavery rally. The Society invited Americans to observe the Fourth of July on the Grove in Framingham, just outside of Boston, on July 4, 1854. The event featured speeches from leading abolitionists such as William Lloyd Garrison and Henry David Thoreau. Rather than a celebration of freedom and independence, abolitionists used the occasion to highlight the incongruities between the Fourth of July rhetoric and the continued enslavement of African Americans. During his speech, Garrison burned a copy of the 1850 Fugitive Slave Act in front of the crowd. While Garrison’s radical actions stunned even some abolitionists in the crowd, he made a strong impression and presented effective criticism of the Fourth of July. One of the most significant Fourth of July celebrations in American history took place on the Centennial anniversary of the Declaration of Independence on July 4, 1876 during Reconstruction. The day marked 100 years since America declared independence, and was used as an opportunity to unite the North and South after the divisions of the Civil War in Independence Square in Philadelphia. The official program for the Centennial in Philadelphia included a number of orchestra performances, a greeting from the Emperor of Brazil, and a reading of the Declaration of Independence by Richard Henry Lee. Centennial organizers hung a new Liberty Bell in Independence Hall to replace the original that had been cracked. Made from four Civil War cannons, the new Liberty Bell rang thirteen times for the crowd in Philadelphia. Throughout the rest of the country, the Centennial was celebrated with a number of activities, including parades, speeches, and fireworks. America’s Bicentennial in 1976 came on the heels of the Civil Rights Movement and at the end to American involvement in the Vietnam War. Most American towns and cities held a Bicentennial celebration on July 4, 1976, with citizen naturalization ceremonies, air shows, and extensive fireworks. One of the most unique Bicentennial events took place in New York City at the South Street Seaport. President Gerald Ford, Vice President Nelson Rockefeller, 3,000 dignitaries, and six million Americans gathered at the shoreline to watch over 200 ships sail into the harbor. Millions of additional Americans watched the astounding spectacle on television. Once again, the Fourth of July united the American people in a common celebration. Throughout American history, the Fourth of July has been cause for commemoration and reflection. Officially marking independence for the United States, the holiday also signifies personal liberty. Historic Fourth of July celebrations recognized the achievements of American government, as well as the need for political and social progress. As this Fourth of July holiday approaches, take a minute to think about the meaning of the celebration. Hello Sarah, I would like to talk to you about a project please.